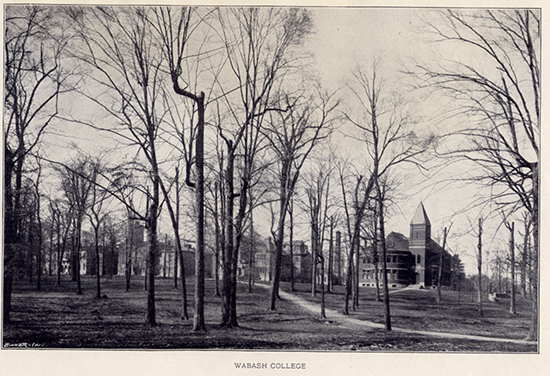 This picture is one of several that were taken in the late 1890’s and used for a promotional piece advertising Wabash College. As we look at this picture, let’s start at the far right with the brand new Yandes Library [which was expanded and renamed Detchon roughly 100 years later. The next thing we see is the smoke stack for the powerhouse. That structure was located about where our Mall flag pole is today. Moving left is Peck Hall of Science home to Chemistry and Physics. 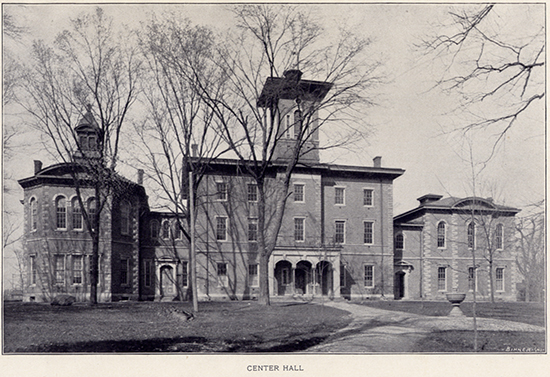 It was demolished to build Waugh Hall, which was demolished to build Hays Hall. 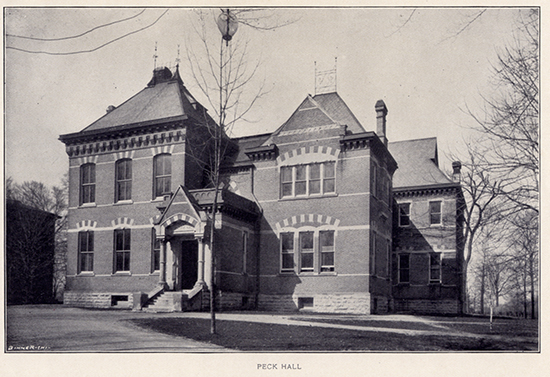 Here is a photograph of Peck Hall. 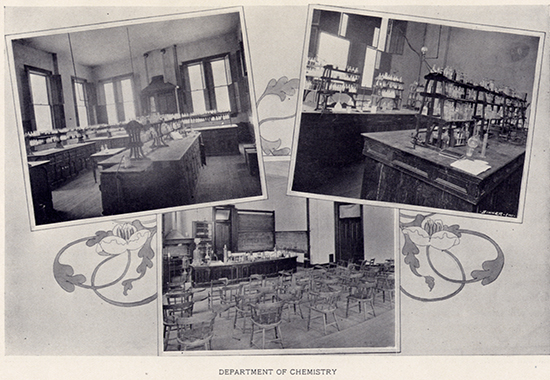 This is a look inside Peck Hall at the Chemistry Department in the 1890’s. 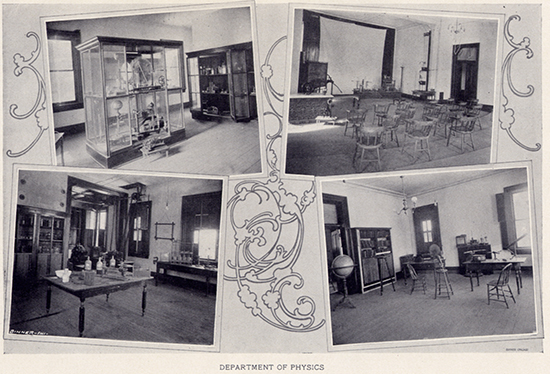 And below is the Physics Department. The next series of pictures are of Center Hall. 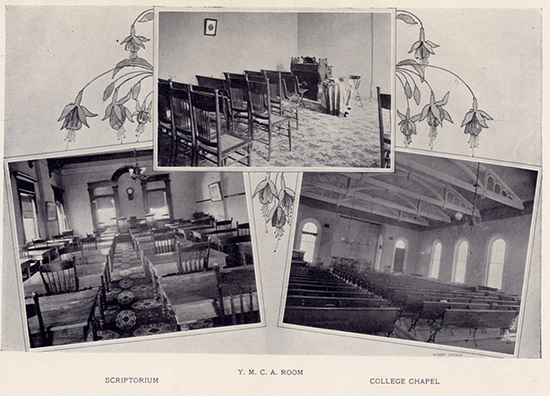 One item to note in the image below is the water fountain – mostly forgotten now and located on the west side of the Chapel as a planter. 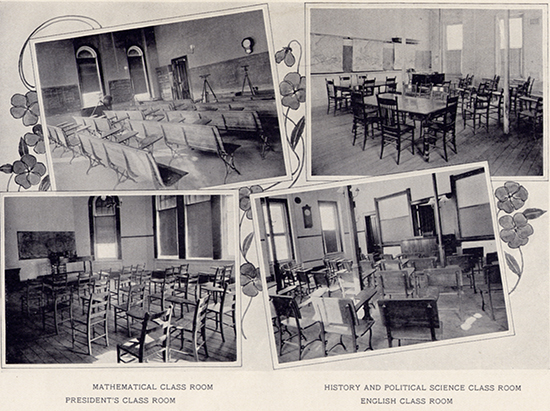 Here are four different classrooms in Center Hall. You may note the Mathematical classroom has tri-pods at the front. There was a time when engineering was a major part of the curriculum. This next set of images are also Center Hall – the Scriptorium and the Y.M.C.A. room are on the third floor and the College Chapel is the entire second floor of the north wing. Today that space is occupied by Religion and Philosophy faculty and the Tuttle Chapel. In my next post we will have a look at the Biological Department, a few fraternities and the faculty of the time.